The All-On-Four method provides stable, optimized, implant-supported dentures at a cost much lower than full implant placement. This interesting application of both implants and dentures offers patients a high level of convenience and multiple health benefits. however, the patient must attend one or two office visits so that impressions, 3D images and photos can be collected to help plan the procedure. For patients requiring extractions prior to the All-On-Four procedure, these can be done on the same day as the surgery. 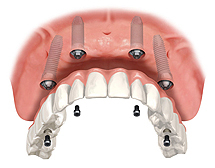 After the implants are placed, a temporary set of teeth are attached to them. Over the next several months, time is given to allow for the bones to fuse with the titanium implants, preparing the way for the use of a more sturdy set of permanent teeth. During this time, the patient sees the doctor several times to monitor the progress of the implants. When the implants are sufficiently stable and the bones and gums have healed, new impressions are made and the permanent prostheses (dentures) are prepared and installed. All-On-Four Implant-secured dentures offer patients in San Diego a dramatic advantage over conventional dentures in terms of stability. Whereas conventional dentures are secured in many cases only with a suction seal, the All-On-Four method leaves patients at virtually no risk of slippage or other embarrassing denture mishaps. Patients who choose the All-On-Four method will not be as restricted when it comes to food. Speech is also made easier and more natural sounding. Additionally, no bone graft surgery required. The placement of the titanium implants allows the bone to grow around them naturally, securing them comfortably and snugly. Compared to full implant placement—where an implant attached to a porcelain tooth is used to replace all teeth—the All-On-Four solution is considerably less expensive. Another way that some patients save on cost is by using an All-On-Four implant secured denture on their lower jaw only, as the lower jaw is more likely than the upper jaw to experience the persistent, aggravating slippage of conventional dentures. San Diego patients will be glad to know that using implant-secured dentures not only provides more stability and comfort, but also promotes bone and tissue health. Dental implants have a way of stimulating the bones and tissues in which they're embedded. Bone and tissue that have atrophied during tooth loss may begin to develop and strengthen after titanium implants are placed. If you’re in or near the San Diego area and interested in experiencing life more comfortably and confidently, then we encourage you to schedule a All-on-Four dental implant consultation with us today!